The Council of Administrators of Special Education Inc. is a division of the Council for Exceptional Children. Some of you are wondering why I would state the obvious, and others of you had no idea that there was a connection. If you are a member of CASE, you are also a member of CEC. This weekly update is not a member service; anyone who goes to the CASE website can sign up to receive this electronic weekly update. Some of the content is not "from" CASE or CEC but a compilation of current articles we believe our members and colleagues would be interested in or should know about. In fact some of the articles take positions that are opposed by CASE but that we believe everyone in the field should be aware. I believe, and our leadership believes, all professionals involved in the supervision of programs for students with disabilities and/or talents or professionals involved in the training of administrators who will be supervising programs for students with disabilities SHOULD be members of their professional organization, CASE. We believe we provide critical resources to both groups of people. Most CASE members were at one time a teacher of students with disabilities and, as such, most of us started out as CEC members and maybe another content-oriented division (i.e. CCBD, DLD, DEC, DADD, etc). Many CASE members are still members of multiple divisions. Whenever you are a member of an organization, you should also be engaged in that organization. In order for any organization to grow and prosper, it has to be responsive to its members. But how can an organization be responsive if the members do not get involved? How will the organization know what is needed by the members if the members do not make their needs known? In today's world of instant communication, there are so many ways to provide input. CASE and CEC both have Twitter accounts, Facebook pages, conduct online surveys and still conduct town hall meetings. But one of the best ways to demonstrate your engagement in an organization is to vote in the annual elections. CEC just completed an election. 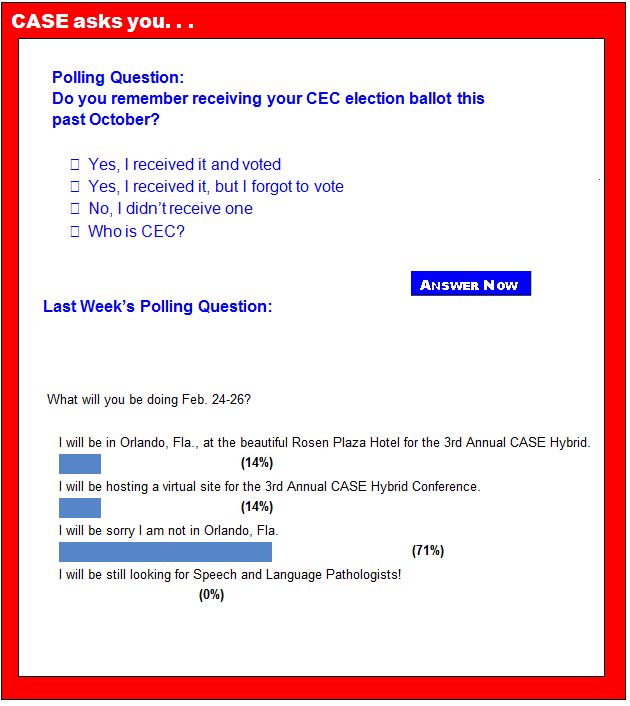 The slate of candidates were sent to you as an email by CEC and an electronic link to vote. CASE printed the complete slate in our fall newsletter and in at least 3 of these weekly updates you were encouraged to vote. The candidates were all deserving of the offices and yet less than 10% of the membership voted. Did you? This is a critical time for all education associations. The article below from NCLD is about parental opinions on funding cuts. This is a time when we must ALL be engaged in the solutions for the problems facing our schools, districts, states and provinces. We congratulate all those who won offices in CEC — the results can be found here. CASE will be holding our election for President Elect and Treasurer in February. Nominations are being sought now by past President, Dr. Mary Kealy. Download the nomination form now if you are interested in either of these positions, or you want to nominate someone for these positions. But PLEASE plan now to be engaged enough in CASE to vote. We want to have at least 25 percent of our membership vote. We will give you plenty of information on the candidates and the dates of the election in mid-January. Black Friday and Cyber Monday early bird registration special! We hope you will consider either becoming a virtual site for our CASE Winter Conference, Keeping Up in Changing Times, Feb. 24-26 or attending on site with us at the Rosen Plaza Hotel, Orlando, Fla. This is our 3rd year for doing a Hybrid conference and we believe we have the perfect combination for providing cutting edge professional development on a shoe string. Prices haven't changed and if you are a virtual site, it is the cost of just one registration. We will provide you with promotion materials and lots of ideas to help you have a great experience. Remember, because each day is "self contained," you can target different audiences for each day! But ... where else would you want to be in February than in sunny Orlando, Fla., at the wonderful Rosen Plaza hotel with a room rate of $119! Watch the CASE website www.casecec.org for additional details and registration in the coming weeks! Under sequestration, Congress cut $2.5 billion from federal education funding in fi­scal year 2013, including $579 million from special education — IDEA Part B. We surveyed more than 1,000 NCLD parents online to see how budget cuts have affected their children's education. This infographic shows a summary of the results. The call to ensure that every student, including students with disabilities, graduates from high school well prepared for college and careers is acknowledged by policymakers, professionals and business leaders. All students deserve access to the academic skills they need so that they can make their own career decisions. They should not have those decisions made for them because they did not have the academic preparation they needed or, worse, left high school with a diploma believing they had been prepared. The results for the 2013 National Assessment of Educational Progress are in, and the scores for students with disabilities are dismal. Not only are very few students with disabilities meeting proficiency on NAEP — better known as the Nation's Report Card — but large achievement gaps between students with and without disabilities remain. NAEP is an assessment given to a representative sample of more than 700,000 students across the country. This will not come as a surprise to special educators: Providing early childhood education to children and families supports later development and growth. In fact, over a decade of research has found that quality preschool leads to a wide range of short and long term benefits, including better educational outcomes, stronger job earnings, lower levels of crime delinquency and even fewer referrals to special education. Widening the definition of attention deficit hyperactivity disorder has led to an overdiagnosis of the condition, causing many people, especially children, to receive needless and potentially harmful medical treatment, according to a research analysis published in the British Medical Journal. The expansion of the definition of the disorder also threatens to create a skepticism about ADHD diagnoses that may harm people who have severe cases and "who unquestionably need sensitive, skilled specialist help and support," warn the Australian and Dutch authors of the analysis. Marcellus Antonio McRae says: In California — and in many other states — the Legislature has proven devastatingly ineffective at ensuring equal educational opportunity in our public schools and protecting the fundamental rights of students. Students with disabilities are more frequently the targets of bullies, according to education experts. Children identified as having special needs are three to five times more at risk for being the targets of bullies than other children, according to the state Department of Education’s web site. "Often, it takes shape in a way that presents the least resistance to being held accountable, and often occurs when adults are not paying attention," department spokeswoman Kelly Donnelly said. "Bullying often occurs when an aggressor is presented with the opportunity to tease, taunt, threaten, exclude, or even cause physical harm and there is a low likelihood of being caught in the act." For American students with disabilities, class sizes are increasing, services are waning and providers are disappearing. More than half of parents who have children with disabilities and responded to a survey say their schools have altered special education services because of declining funding since last year — in some cases, because of federal budget cuts known as sequestration, according to recently released survey results. Special education, an operation long viewed in Sacramento, Calif., as too big and confounding to reform, may finally grab policymakers' attention. Three state education agencies have announced the creation of a foundation-funded "Task Force On Special Education." In Minnesota, the St. Paul School District has changed its special education program in a big way — moving hundreds of students from separate special education to general education classrooms. Schools vs. students: It's a battle being waged over special education services in courtrooms throughout the state of California. And many parents of students with disabilities are finding that getting the free and appropriate education that their children are entitled to under federal law can come at a great emotional and financial cost.